Pressure test carts from Pneumatic and Hydraulic are a convenient way to provide pressure wherever city water and compressed air is available. All of the components are mounted and plumbed in a stainless steel or powder-coated, 2-wheel cart with a sloped front control box containing the valves and gauges. Safety devices, such as relief valves, are available with all designs to protect operators from over-pressurization. 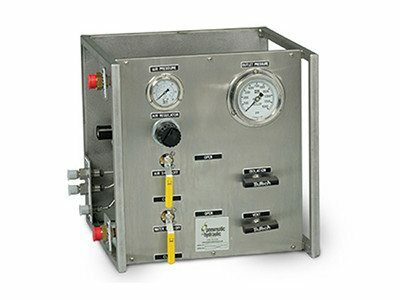 Designs for pressures up to 100,000 psi are available and there is an 8 gallon optional reservoir that can be added if desired. We also offer portable carts designed specifically for filtration. Fluid cleanliness is an absolute necessity when it comes to keeping equipment at maximum operating status. Pneumatic and Hydraulic is able to provide carts for NAS level filtration for a wide variety of fluids, including water and oil. Let us build your custom filter cart to ensure cleanliness of all your operating fluids.